I debated using the term “protein powder” in the title of this post, because I feel that doesn’t do justice to collagen. Collagen is so much more bang for your buck without the questionable processing steps or additives of popular protein powders. But looking at collagen from the perspective of protein, it is a highly adaptable way to increase your intake of highly digestible, nutrient-dense protein. This post is kindly sponsored by Vital Proteins. As you know, I only work with companies when I’ve had an extremely positive experience with their product, when I’ve personally spoken with the founder(s), and when I admire the integrity of the company. What is Vital Proteins Collagen? Vital Proteins offers two forms of collagen – one that gels (gelatin) and one that dissolves instantly and can be used as a protein powder. Before getting into the benefits of their collagen, it’s important to understand the difference between Vital Protein’s Collagen Peptides and Vital Protein’s Collagen Protein (gelatin). Collagen Peptides – (Blue lid) These peptides are derived from gelatin, and contain the same amino acids as gelatin. The main difference is use – the peptides dissolve instantly in hot or cold liquids without gelling for an easy nutrition boost. Beef Gelatin – (Green lid) Think gelatin. Remember, it has the same nutritional benefits of collagen peptides because it is the same amino acids. However, collagen protein can be used to make homemade jello or gummies because it gels. 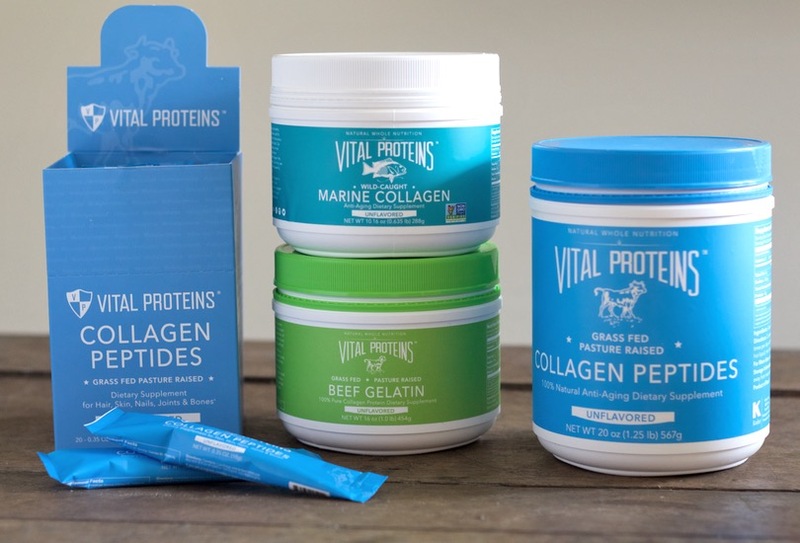 How does Vital Proteins compare to other grassfed collagen? If you are familiar with many of the recipes I’ve shared, such as my Tulsi Gelee and Coconut Flour Pancakes with Gelatin, you’ll likely have seen my recommendation for Great Lakes grassfed gelatin. Single-sourced pasture-raised bovine hide from Brazil. Unlike gelatin and collagen sourced from Argentina, where cattle are typically grain finished, Vital Proteins is sourced from cattle grazing on perennial tropical grass pasture systems. Vital Proteins also ensures the pasture size for each animal is at least 2.67 acres, the standard of the Global Animal Partnership’s 5-step Animal Welfare Rating Standards. Non-BPA, air-tight canisters prevent moisture. They hermetically induction seal their canisters to prevent any moisture from entering. Collagen is very hygroscopic and without this protection, the collagen will start to degrade due to bacteria. Cardboard canisters are more susceptible to moisture and contamination from odors and chemicals. Excellent customer service, no back orders, and free shipping on all orders. I’m a loyal convert to Vital Proteins. Now, here are some of the unique benefits of collagen! I was excited but not surprised to learn that clinical studies show that daily consumption of collagen significantly improves skin elasticity and moisture. I emphasize my collagen intake during the winter, when I feel like my skin needs extra support from the dry air. The interesting research on gelatin proteins and hormones comes from controversial health researcher Dr. Ray Peat. I think Dr. Peat has many excellent points, although I also keep in mind bioindividuality when reading his more controversial work. By helping to balance the tryptophan, collagen can supports healthy thyroid function and reduces the metabolic stress of increased cortisol. Thyroid and metabolism go hand-in-hand, so gelatin may actually increase metabolism by improving thyroid function. Collagen makes up to 90% of bone mass, and several studies indicate that taking collagen internally can improve bone metabolism. When it comes to building bone density, conventional medicine often looks solely at calcium. This is a tremendous mistake, because cofactors in bone metabolism such as vitamin K2, vitamin D and magnesium are as important – if not more so – than calcium intake for bone health. I recently discussed this topic in my post, 3 Reasons Why I Avoid Calcium Supplements. Collagen supplementation is likely another key factor in improving bone health along with other vitamin and mineral cofactors. 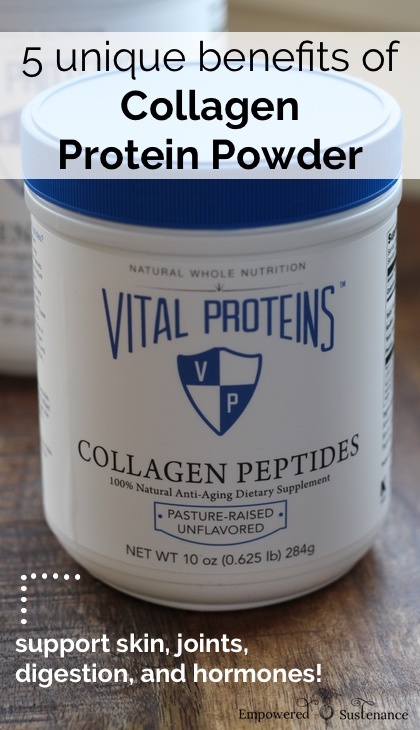 The research Vital Proteins has collected on collagen and bone shows that the presence of collagen peptides stimulate osteoblasts, the cells responsible for bone formation. Studies also suggest that collagen supplementation can improve joint pain. In these studies, those with the most severe joint damage benefited the most (sources). I’m not a fan of protein powders, because they are often highly processed and not well-absorbed forms of protein. Collagen peptides, on the other hand, are one of my favorite ways to boost my protein intake and create nutrient-dense protein shakes. Collagen peptides are essentially pure protein: two scoops of Vital Proteins collagen provides 18 grams of protein! Interestingly, studies show that collagen peptides consumed at breakfast are 40% more satiating than other proteins (such as whey or soy) and correlate to a 20% reduction of food intake at lunch. (Sources). Additionally, the amino acids in collagen provide unique soothing and reparative properties for the digestive tract. The high concentration of the amino acid glycine stimulates stomach acid production and thereby improves digestion and nutrient assimilation. Low stomach acid is a chronic problem that leads to a cascade of symptoms in the entire body, so increasing stomach acid often alleviates a host of issues. If I feel ill and not able to digest heavy foods, I’ll often fortify my tea with coconut oil and collagen for highly-digestible nourishment. 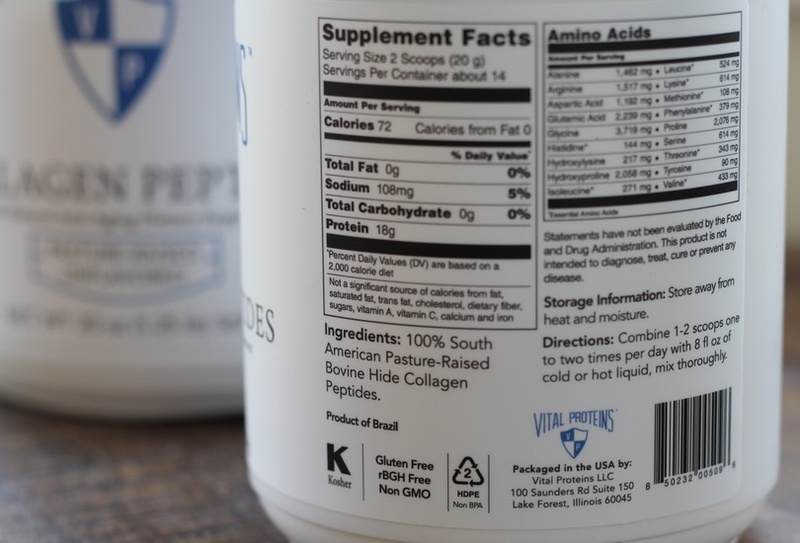 Unlike Vital Protein’s grassfed gelatin, their collagen peptides do not gel when added to cold liquid. It dissolves completely, and is tasteless and odorless. The only time I detect a hint of flavor is when I take it in plain water (which works in a pinch, but I wouldn’t recommend it). Instead, suggest mixing it into your beverages. 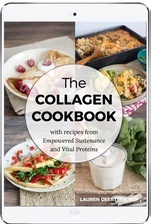 In collaboration with Vital Proteins, I’ve compiled The Collagen Cookbook for you. This beautifully-photographed downloadable cookbook features nutrient-dense, paleo-friendly recipes. Download it here for free, and I hope you enjoy it! 2 wks ago I started taking 2 scoops per day Orgain Collagen Peptides because at 70 I am losing much of my hair. When I started getting gassy and constipated, I checked out the ingredients and discovered iron was in it! UGH To say the least, I have not gone to the bathroom in a wk and am off to the store to get a saline drink, the type used as prep for a colonoscopy. This condition for me is nothing new. I have dealt with this since I was a child! I did notice after I purchased some prune yogurt, things started to happen, so I bought prune juice. NOTHING for the wk. Back to a saline flsuh once a wk for some relief. Does all collagen contain iron? I would love to get my hair growth back and rid myself of aging saggy skin, but this is ridiculous! Suggestion?